Approximately six to eight million people in Germany suffer from urinary incontinence, commonly referred to as bladder weakness. For many of those affected, this condition is often a taboo subject despite the enormous suffering it causes. Urinary incontinence is an involuntary and unintentional discharge of urine. This involuntary leakage of urine can be pronounced differently, from a few drops to permanent leakage. 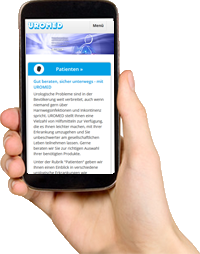 In addition, the German Incontinence Society distinguishes various forms of urinary incontinence. The most common forms are presented here. Stress incontinence is characterised by the loss of urine due to increased pressure in the abdomen. Everyday physical exertion such as coughing, sneezing, laughing and lifting heavy loads can lead to an involuntary and uncontrolled discharge of urine. Stress incontinence is caused by impaired sphincter function due to pelvic floor weakness and nerve malfunction. Pelvic floor weakness may be caused by age, pregnancy and vaginal birth, surgeries (e.g. on the prostate or uterus), as well as weakness of the connective tissue. Stress incontinence occurs more frequently in women than in men. A sudden, irresistible urge to urinate, which can often occur at short intervals and even when the bladder is not full, forces the person concerned to seek a toilet immediately. Urge incontinence is given when the urge symptoms cannot be delayed and there is an involuntary leakage of urine before a toilet can be reached. It also involves a frequent urge to urinate with frequent visits to the toilet at very short intervals (<30 minutes) to drain only small amounts of urine. Reasons for this form of urinary incontinence can be a small bladder, bladder infections, instability of the bladder muscle, and tumours. Urge incontinence is the most common type of incontinence in the elderly. Stress and urge incontinence can also occur in combination. If you suffer from an overactive bladder combined with a disorder of the closure system, this is called mixed incontinence. The stress incontinence and the urge incontinence are treated separately. If the pressure in the urinary bladder exceeds the pressure of the bladder sphincter, a continuous trickle of urine is discharged. This is known as overflow incontinence. The bladder is constantly overfilled and continuously releases small amounts of urine in the absence of any urge to urinate. 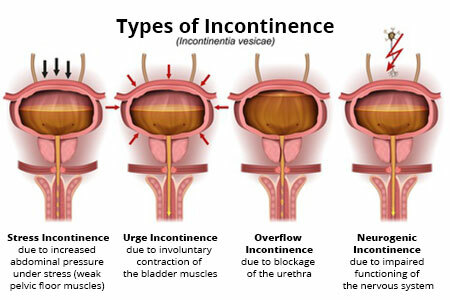 Men are more affected by this type of incontinence than women. Reasons for overflow incontinence can be drainage disorders, e.g. due to urinary stones, tumours or nerve damage. In many cases, an enlarged prostate can also cause a blockage of the bladder outlet. Paraplegia can cause the nerve paths which control bladder function to be interrupted. Patients no longer sense when the bladder is full. The result is an involuntary discharge of urine at varying intervals. Supraspinal reflex incontinence: Brain performance is impaired by diseases such as Alzheimer’s, Parkinson’s, dementia or by a stroke. Spinal reflex incontinence: The connection from the brain to the spinal cord is interrupted. The cause is a disease or injury to the spinal cord (e.g. paraplegia, multiple sclerosis). There is no control over the function of the bladder or sphincters. In many cases, the incontinence can be cured, or at least improved, through targeted treatment. The treatment must be individually tailored to the cause of the urinary incontinence, the type and extent of the complaints, however as well to the patient’s particular situation. Some forms of incontinence can be alleviated, for example, by means of physiotherapy exercises to strengthen the pelvic floor muscles. Drug therapy can also help. Other treatment options include surgeries to restore the pelvic floor and urethral function, or elimination of drainage problems and targeted toilet training.